It all began when I understood that it’s the limbic system, hippocampus and amygdala that control our emotions and not the HEART. It all began when I agreed to this DARING ADVENTURE. From being reluctant to taking up medical sciences in senior year, to reaching the third year in physiotherapy, I have come a long way. I still remember the day when I had very reluctantly entered my college on 27th July 2016. I was determined on NOT becoming a therapist. But I guess destiny had some different plans. Soon began my journey which made me realize that there’s more to me. My college life has been more than just bunking classes, messing around and freedom. It’s like a rainbow that added colors to my life. The very first and the most essential color have been my friends. After all what is college life without friends? Not being so outgoing, making friends had always been a task for me. Something that I had to prepare for! I never understood how could people have so many friends and still be themselves. I was just opposing the idea when a few people barged into my life and refused to let go. Be it the terrifying practical exam or the birthday celebrations, they made every moment memorable. Not to forget the crazy moments like finding a name for the skeleton in class or the having snacks at the Shiv tikki food joint. There’s never been a dull moment with them. I remember the day very clearly. One of my friends had asked me if I could join them for a visit to Mughal Gardens. I was about to refuse but then upon my mom’s insistence, I agreed. From that day there was no looking back. I have never been so content about saying ‘Yes’ to anything before. The second gift my college life gave me was my writing. I owe all my potential and confidence to write here. I have been entrusted with opportunities to host events like the Fresher’s party and the Annual Day. These instances have made me believe that “You get in life what you have the courage to ask for”. Then the best of the color of my college life till date has been every time a patient was relieved of his/her pain. It is quite unique and extraordinary feeling that you get when you realize that you can heal someone. Satisfaction is a small term to explain it. It’s been magical to see a hemiplegic patient (paralysis of one side of body) rehabilitate and be able to walk after months of rigorous therapy. Every day has been a challenge. I still remember the day I entered the Dissection Hall for the first time. The memory is still alive. Talking to bones and treating the Electro therapy book as your favorite novel has been a regular practice. 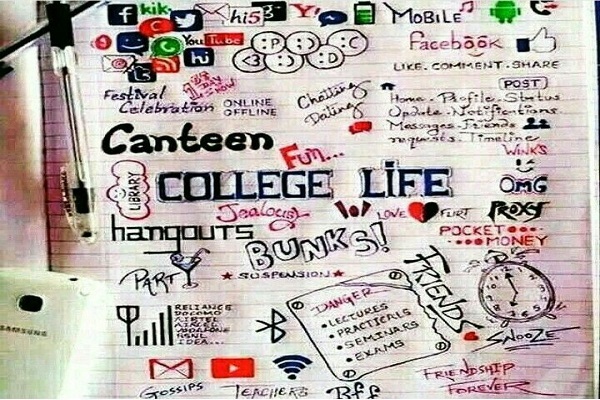 I would like to contradict the dull, boring picture you have drawn in your mind about my ‘Not so happening’ college life. Ours is the 18th batch of my college and trust me, we have left no stone unturned to prove the same. We have been ‘infamous’ for our share of fights, mass bunks followed by punishments like suspensions and no vacations. But what is college life without some spice? After all, ‘All work and no play, makes Jack a dull boy’, right? College is a place that becomes your second home. As they say ‘A home away from home’. The teachers, seniors and other staff members, not to forget your batch mates, become your family. They are no longer just a part of my being; in fact they have now begun defining who I am. The journey begins with big dreams and a fear filled heart gradually changes into magnificent accomplishments and lots of memories. It’s hard to even dream of a day without my college. With hope, happiness and joy…. Author Bio : MRIDULA, Mridula is a physiotherapy student at Amar Jyoti Institute of Physiotherapy (DU) and an ardent writer who finds solace with words. She weaves words that make a difference to the world and aims to make her family proud.